So many things to share, but where to start??? Is it sad that I had to make a list of things to talk about? Oh well... at least it will all get shared. By the way, this is another pic from my flight. So if you were wondering, no, I haven't been able to go up again. I have to start off by answering a question for a friend. Yes, you use both your hands and feet to fly a chopper. Your hands control the cyclic (joystick thing) and the collective (a lever on the left side of the pilot) and there are pedals for your feet that control the tail rotor. So all 4 of your limbs are working when you fly. Pretty cool, huh? The house is coming along. A little slower than I was hoping, but that's the way things work when life gets in the way, as it usually does. I'm at the point where I need to start getting things out of the way so we can paint the rest of the house. My parents are being so generous by allowing me to store my extra "junk" at their house. My dad has created a very comfortable room in the basement for me (with some inspiration from Ramona) and that is where I'm starting to haul my stuff to. Once I get all the extra stuff out of the way I'll hopefully be able to use Kade's brother's muscles to move all of my furniture to the center of each room thereby clearing up the walls for painting. After that I'm thinking all we will need to do is stage the place, and then we'll be able to list it! Cross your fingers and pray that it sells quickly and for a good amount! While I would like to save the majority of it for our future purchase of a house (we'll be renting for a while) I would like to use some of it to pay off part of our debt. We'll see what happens though. It's a tough market! Part of the slow down we have experienced has to do with our little niece Mercydez. Most of the people that read this know Nic & Ashley (Kade's sister and husband) as well and already know what's been happening. I'll quickly catch up the ones that don't know. Nic & Ashley had Mercydez on Jan 3, 2008. After lots of tests and surgerys she was diagnosed with Charge syndrome. She has been asked to deal with a tremendous amount in the short time she has been on this earth. Mercydez has been a blessing and an inspiration to Kade's whole family and many others since day one. About a week and a half ago she got sick. With all of her other difficulties her immune system is not where it needs to be to deal with even the smallest illness. A week ago today we thought we were going to lose her. She's a fighter though and she rallied. But on Monday she really struggled again and we all got ready to say our goodbyes. It was the kind of experience that words can't do justice for, so I won't even try to explain. Little Mercy wasn't having it though! I have to wonder if she continues to do this just to show us how strong her little spirit really is. Poor uncle Kade though! With him in Idaho it's a little harder for him to be there when these things happen. I called him late Saturday afternoon and told him the situation. He was there that night ready for whatever happened. When she rallied on Sunday we thought it would be ok for him to go back on Monday. He left Monday morning and then at about noon we got a call saying that it looked really bad again. He was over half way back when he turned around. He sure does love that little girl! She is still with us today and from what her mom has told us, she's improving. It's slow, but it's there! This is from the Saturday night right before Kade moved to Idaho. With Kade going back and forth from Idaho, it has put him a little bit behind on his studies. Not much though. He was supposed to have a check ride for his CFII on Monday, but it's been pushed back to Wednesday. So It will be so nice when it's over! Then we will no longer be paying for Kade to fly! He's gonna get PAID!! He's paid now, but we still have to pay for the time that he's a student. What a great accomplishment for him!!! I couldn't be prouder of my amazing husband! He is a wonderful gift in my life! I would like to take a second a thank my wonderful grandparents. First of all for living in the right city (seeing as how they've lived here for 55 years!) and secondly for being so willing to take him in! It is such a blessing and a comfort knowing that my husband is being taken care of by wonderful people that truly love him! So THANK YOU!!!!! We love you! So apparently I've been "tagged" by Ashley. I had to find out what that was all about first, and now all I have to figure out is what I'm supposed to do with it. Hopefully I'll be able to do that soon! It looks pretty funny. And last of all, I received some pretty sad news this afternoon. I found out that my dad and Ramona had to put Ramona's dog Chloe down today. I'm so sorry! She was always a lot of fun! Chloe was older, but that didn't stop her from anything. She would run around with my dog Dakota (who's only about a year and a half) as though she was a young spring chicken! If he ran, she ran. She didn't always get the point of the running, but she did it! Chloe would also guard her food as if it were pure gold if Dakota was around. She was a spunky little thing! And even though she didn't seem to always "get it", I think she was a LOT smarter than she let on. She learned how to climb the chainlink fence in the backyard! How cool is that?!?!?! While it was annoying to the loving owners that she constantly took herself for walks, she was pretty clever, that little one. Anyway, Chloe will be missed. That pretty much covers all the news that I know of. I'm sorry this is so long, but that happens when I'm only able to blog every so often. Thanks again for reading! Good to hear how you're doing. Tell Kade I said hi. I'm going to be in Utah in 2 weeks wahoo! Thanks for clarifying about the whole hands and feet thing. I still can't imagine flying with my feet. Oh well! Anyway, I wanted to say that I'm really sorry about your niece. I know that it has been a difficult journey from day one for everyone involved especially the parents, but what strong people all of you are to see the many blessings that have been had since that first day. Continue to enjoy her love and sweet spirit. By the way, we miss you guys! Good luck with the condo. Glad to hear your neice is still hanging in there. I can't imagine how hard this must be for all of you. Our prayers are with all of you. Give us a call sometime when you guys have time to get together! The kids and I fly up there next Friday, yahoo! 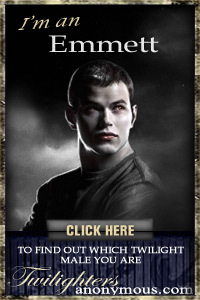 How did you get Kade to take the twilight questionnaire? Tom mocks me wildly and freely about anything Twilight. Silly boy. Oh, tickets for opening night went on sale today. Are you coming to Stacy's for Thanksgiving?